MOSCOW, March 29. /TASS/. Washington will never remove sanctions on Moscow because this is what its policies have been based on for years, Russian Prime Minister Dmitry Medvedev said while answering questions from users of the VKontakte social network on Friday. "I can tell you frankly: they will never remove sanctions on Russia because their policies - at least in the past 100 years - have been based on the continuous use of sanctions against our country, no matter what it is called, the Soviet Union or the Russian Federation. 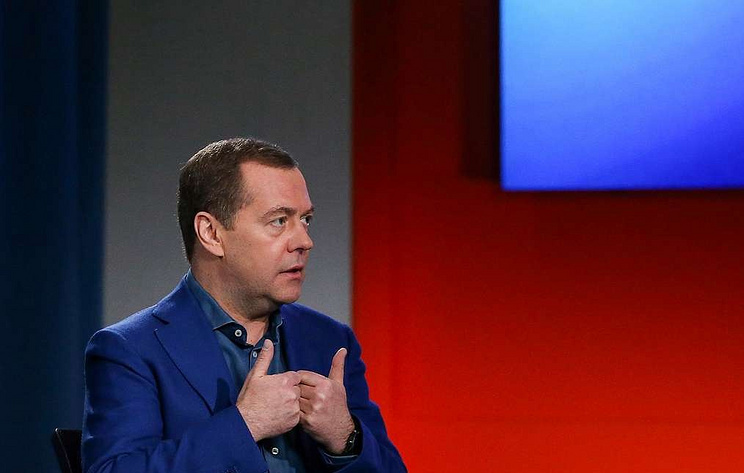 There hasn’t been a single historical period when there were no sanctions at all," Medvedev pointed out. The Russian prime minister said that Washington’s position was regrettable "because it undermines international cooperation to a certain extent and prevents us from working together with the US to resolve key issues concerning global security and economic development." A girl who asked the question about sanctions also requested the prime minister give her an autograph. "With pleasure," said Medvedev. He signed a piece of paper and handed it over to the event’s moderator, asking her to pass it to the girl.